Adoration of the Magi, Unknown Ottonian, c 1030. Getty Museum. Adoration of the Magi, Unknown German, 1240. Getty Museum. Adoration of the Magi, Nicola Pisano, 1260. Web Gallery of Art. Adoration of the Magi, Black Bourton, Oxfordshire, late 13th century. Medieval Wall Painting in the English Parish Church. Adoration of the Magi/Dream of the Magi, Wissington, Suffolk, late 13th century. Medieval Wall Painting in the English Parish Church. Adoration of the Magi, Pinvin, Worcestershire, 13th/15th century. Medieval Wall Painting in the English Parish Church. Adoration of the Magi/Shepherds, Thornham Parva, Suffolk, late 14th century. Medieval Wall Painting in the English Parish Church. Adoration of the Magi, Bartolo di Fredi, 1380's. Web Gallery of Art. The Adoration of the Magi (Bargello Diptych), Unknown French, c. 1380-90. Web Gallery of Art. Adoration of the Magi, Master of the Brussels Initials, 1389. Getty Museum. Adoration of the Magi, Heydon, Norfolk, 14/15 century. Medieval Wall Painting in the English Parish Church. The Return of the Magi, Giovanni da Modena, c. 1410. Web Gallery of Art. Adoration, Master of the Vienna Adoration, c. 1410. Web Gallery of Art. Adoration of the Magi, Boucicaut Master, c 1415. Getty Museum. The Meeting of the Magi, Limbourg Brothers, before 1416. Christus Rex. The Adoration of the Magi, German, 1420. Web Gallery of Art. Adoration of the Magi, Lorenzo Monaco, 1422. Web Gallery of Art. Adoration of the Magi, Gentile da Fabriano, 1423. Web Gallery of Art. Adoration of the Magi, Master Francke, 1424. Web Gallery of Art. The Adoration of the Magi, Zanobi Strozzi, 1433-34. National Gallery, London. Adoration of the Magi, Stefano da Zevio, 1435. Web Gallery of Art. The Adoration of the Magi, Hans Multscher, 1437. Web Gallery of Art. Adoration of the Magi, Stefan Lochner, c. 1440. Web Gallery of Art. Adoration of the Magi, Domenico Veneziano, 1440-43. Web Gallery of Art. Adoration of the Magi, Konrad Witz, 1443-44. Web Gallery of Art. Adoration of the Magi, Dieric Bouts the Elder, c. 1445. Web Gallery of Art. The Adoration of the Magi, Giovanni di Paolo di Grazia, c 1450. National Gallery of Art. The Adoration of the Magi, Master E.S., c 1450. National Gallery of Art. The Adoration of the Magi, Master of the Llangattock Epiphany, 1450's. The Getty Museum. Adoration of the Magi, Juan Reixach, 1450-90. Web Gallery of Art. Adoration of the Magi, Unknown Spanish, 1450-1500. Web Gallery of Art. The Adoration of the Magi, Willem Vrelant, 1460's. The Getty Museum. The Epiphany, Andrea Mantegna, 1463-1470. CGFA. The Adoration of the Magi, Justus of Ghent (Joos van Wassenhove), c. 1465. Metropolitan Museum of Art. The Adoration of the Kings, and Christ on the Cross, Benedetto Bonfigli, c. 1465-75. National Gallery, London. The Adoration of the Magi, Benvenuto di Giovanni, c. 1470. National Gallery of Art. The Adoration of the Magi, Dieric Bouts the Younger, c. 1470. Web Gallery of Art. Adoration of the Magi, Hugo van der Goes, c. 1470. Olga's Gallery. Adoration of the Magi, Hans Memling, c. 1470. Web Gallery of Art. Adoration of the Magi, Unknown German, 1470-80. Web Gallery of Art. The Adoration of the Kings, Master of Liesborn, 1470-80. National Gallery, London. Adoration of the Magi, Martin Schongauer, c. 1475. Web Gallery of Art. Adoration of the Magi, Salisbury, Wiltshire, late 15th century. Medieval Wall Painting in the English Parish Church. The Adoration of the Kings, Giovanni Bellini, 1475-80. National Gallery, London. Adoration of the Magi, Flemish, 1475-1500. Web Gallery of Art. Adoration of the Kings (Epiphany), Pietro Perugino, c. 1476. Web Gallery of Art. Design for the Adoration of the Magi, Leonardo daVinci, 1478-81. Web Gallery of Art. Epiphany, Fernando Gallego, c. 1480. Web Gallery of Art. The Adoration of the Magi, Georges Trubert, 1480. Getty Museum. Adoration of the Magi, Geertgen tot Sint Jans, 1480-85. Web Gallery of Art. The Adoration of the Magi, Jean Bourdichon, c. 1480-85. The Getty Museum. The Adoration of the Magi, Georges Trubert, c. 1480-90. The Getty Museum. 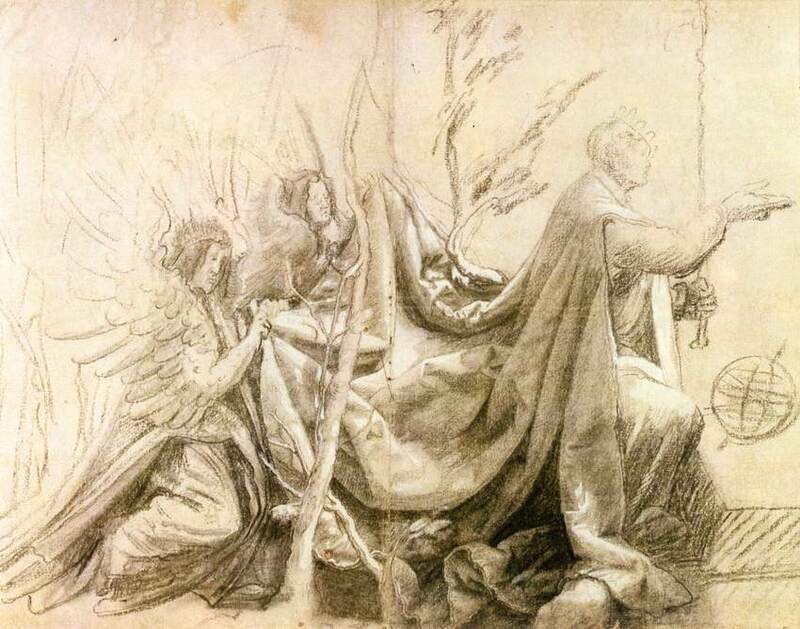 Perspectival Study of the Adoration of the Magi, Leonardo daVinci, c. 1481. Web Gallery of Art. Adoration of the Magi, Leonardo daVinci, 1481-82. Web Gallery of Art. The Adoration of the Magi, Botticelli, early 1480's. National Gallery of Art. Adoration of the Magi at the Spedale degli Innocenti, Domenico Ghirlandaio, 1488. CGFA. The Adoration of the Magi, Bartolomeo di Giovanni, 1490. Web Gallery of Art. The Adoration of the Magi, Gerard David, 1490. CGFA. The Adoration of the Magi, Fiorenzo di Lorenzo, c. 1490. Web Gallery of Art. Adoration of the Magi, Albrecht Dürer, 1494. Biblical Art on the WWW. The Epiphany, Hieronymous Bosch, c. 1495. CGFA. The Adoration of the Magi, central panel in the Epiphany triptych, Hieronymous Bosch. 1495. From CGFA. Adoration of the Magi, Andrea Mantegna, 1495. Getty Museum. Adoration of the Magi, Filippino Lippi, 1496. Web Gallery of Art. Adoration of the Magi, Bramantino, 1498. Web Gallery of Art. The Adoration of the Magi, fourth quarter of 15th Century, North Netherlandish. National Gallery of Art. Adoration of the Magi, Master of Hoogstraeten, c. 1500. Web Gallery of Art. Adoration of the Magi, Gerard David, c 1500. Web Gallery of Art. Adoration of the Magi, Giorgione, c 1500. Web Gallery of Art. Adoration of the Magi, Andrea Mantegna, c 1500. CGFA. The Adoration of the Magi, Colijn deCoter, c. 1500. Web Gallery of Art. Adoration of the Magi, Pedro Berruguete, c 1500. Web Gallery of Art. Adoration of the Magi, Flemish, 1500-10. Web Gallery of Art. The Adoration of the Kings, Jan Gossaert (Mabuse), 1500-15. Web Gallery of Art. Adoration of the Shepherds and Adoration of the Magi, Unknown Flemish, 1500-20. Web Gallery of Art. Adoration of the Magi, Flemish, 1500-25. Web Gallery of Art. Adoration of the Magi, Vasco Fernandes, 1501-06. Web Gallery of Art. The Adoration of the Magi (Oddi altar), Sanzio Raffaello, 1502-03. Web Gallery of Art. The Adoration of the Magi, Albrecht Dürer, 1503. Biblical Art on the WWW. Adoration of the Magi, Albrecht Dürer, 1504. CGFA. The Adoration of the Magi, German, c. 1505. Web Gallery of Art. Adoration of the Magi, Hans Baldung Grien, 1507. Web Gallery of Art. The Adoration of the Magi, Juan de Flandes, c 1508/1519. National Gallery of Art. The Adoration of the Magi, Gerard Horenbout, 1510-20. The Getty Museum. The Adoration of the Magi, Albrecht Dürer, 1511. Michael C. Carlos Museum, Emory University. Adoration of the Magi, Flemish, c. 1515. Web Gallery of Art. Kneeling King with Two Angels, Matthias Grünewald, c. 1515. Web Gallery of Art. The Adoration of the Kings, Gerard David, 1515-23. National Gallery, London. Adoration of the Magi, Correggio, 1516-18. Web Gallery of Art. Triptych of the Adoration of the Magi, Cornelisz van Oostsanen, 1517. Web Gallery of Art. Adoration of the Magi, Defendente Ferrari, 1520. Getty Museum. Adoration of the Magi, Flemish, c. 1520. Web Gallery of Art. The Adoration of the Kings, Baldassare Peruzzi, 1522-23. National Gallery, London. The Adoration of the Wise Men, Albrecht Dürer, 1524. Biblical Art on the WWW. Panel with the Adoration of the Magi, Nicola da Urbino, c 1525. National Gallery of Art. The Adoration of the Magi, Simon Bening, c. 1525-30. The Getty Museum. The Adoration of the Kings, Girolamo da Treviso the Younger, 1525-30. National Gallery, London. Adoration of the Magi, Alonso Berruguete, 1526-32. Web Gallery of Art. The Adoration of the Kings, Dosso Dossi, 1530-42. National Gallery, London. The Adoration of the Kings, Girolamo da Carpi, c. 1545-50. National Gallery, London. The Adoration of the Kings, Pieter Bruegel the Elder, 1555. CGFA. The Adoration of the Kings, Pieter Bruegel the Elder, 1556-62. CGFA. The Adoration of the Magi, Pieter Aertsen, c. 1560. Rijksmuseum. Adoration of the Magi, Titian, 1561. Artehistoria. The Adoration of the Kings, Pieter Bruegel the Elder, 1564. Web Gallery of Art. The Adoration of the Kings, Paolo Veronese, 1573. National Gallery, London. The Adoration of the Kings, Bartholomaeus, c. 1595. National Gallery, London. The Adoration of the Magi, Jan Bruegel the Elder, 1598-1600. State Hermitage Museum. Adoration of the Magi, Giuseppe Cesari, c. 1600-10. Dayton Art Institute. Adoration of the Kings, Fray Juan Bautista, 1612. Web Gallery of Art. Adoration of the Magi, Luis Tristan, 1620. Web Gallery of Art. Adoration of the Magi, Jusepe de Ribera, c. 1620. The Getty Museum. The Adoration of the Magi, Eugenio Cajes, 1620's. Web Gallery of Art. Adoration of the Magi, Pieter Brueghel the Younger, c. 1625. Web Gallery of Art. The Wise Men, Matthaeus Merian the Elder, 1625-30. Biblical Art on the WWW. The Adoration of the Magi, Leonaert Bramer, 1628-30. Web Gallery of Art. Adoration of the Magi, Rembrandt, 1632. Christus Rex. Adoration of the Magi, Nicolas Poussin, 1633. Web Gallery of Art. The Adoration of the Magi, Sebastien Bourdon, 1635-41. National Gallery of Victoria. The Adoration of the Magi, Artemisia Gentileschi, 1636-37. The Life and Art of Artemisia Gentileschi. The Adoration of the Kings, Carlo Dolci, 1649. National Gallery, London. The Adoration of the Magi, Bartolome Esteban Murillo, c 1650/1656. National Gallery of Art. Adoration des Bergers, Abraham Honduis, c 1655. Musee Bordeaux. The Adoration of the Magi, Guillaume Courtois, 1665. Getty Museum. Adoration of the Magi (in Garland), Carlo Maratti, c. 1700. Web Gallery of Art. The Adoration of the Magi, Joseph Highmore, c. 1750. Tate Gallery. Adoration of the Magi, Giovanni Battista Tiepolo, 1753. Web Gallery of Art. The Visit of the Magi, Julius Schnorr von Carolsfeld, 1851-60. Korea Computer Mission. The Wise Men Guided by the Star, Gustave Doré, 1865. Korea Computer Mission. The Wise Men On Their Way to Bethlehem, James Tissot, 1886-96. Korea Computer Mission. The Star of Bethlehem, Edward Burne-Jones, 1888-91. CGFA. The Wise Men Visit Herod, James Tissot, 1886-96. Biblical Art on the WWW. The Nativity, Edward Burne-Jones, c. 1890. Tate Gallery. Three Kings, Joseph Christian Leyendecker, 1900. CGFA. Three Kings, Eric Gill, 1916. Tate Gallery. Epiphany, Eric Gill. Tate Gallery. Epiphany, Albert Herbert, 1962. The Methodist Church Collection of Modern Christian Art. Use of images. Nativity, Henry Moore, 1981. Tate Gallery. Epiphany, John August Swanson, 1988 Serigraph. The Adoration of the Kings, Leon Kossoff, 1998. Tate Gallery. Nativity - The Three Wise Men, Hari Santosa, Indonesia, 2001. Asian Christian Art Association. The Magi, He Qi, 2002. He Qi's Homepage. Adoration of the Kings, Jim Janknegt, contemporary. Holy Family and Magi, Coptic Image Archive, The Coptic Network. The Three Wise Men, African Mafa. The Visit of the Wise Men, Zaki Baboun, Palestina, contemporary. Asian Christian Art Association. Three Wisemen, Wayang Prajanjian, Indonesia. Asian Christian Art Association. The Visit of Magi, He Qi, China. The Star of Bethlehem, Kim Jae Im, Korea. Asian Christian Art Association. Adoration of the Magi, Edward Burne Jones, William Morris, Trinity Church, Saugerties, NY, stainedglassphotography.com.